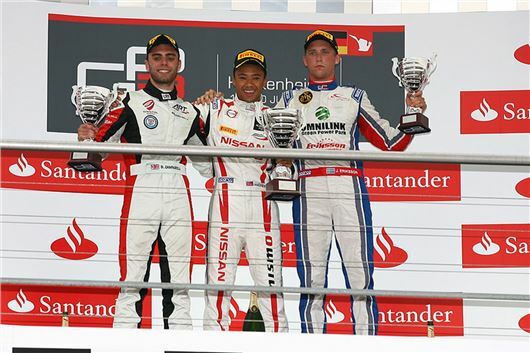 Following his excellent performance at Le Mans and the Goodwood Festival of Speed in a Nissan GT-R, up and coming racer Jann Mardenborough won the GP3 support race at the Grand Prix weekend at Hockenheim. Jann, from Darlington, was a gap year student when he won the 2011 Nissan PlayStation GT Academy competition. Since then he has been a star of Nissan’s driver development programme and becan an extremely professional racing driver. Just over a month ago his performance at the Le Mans 24 Hours caused a great deal of excitement, he was brilliant on the hill at the Goodwood Festival of Speed, and at Hockenheim he took everything he has learned to turn it into victory in GP3, the series for aspiring Formula One drivers. He could well become the next Lewis Hamilton. Playstation GT Academy is now in its sixth year and continues to unearth incredible raw talent. This year’s national finals have now taken place around the world as GT Academy expands to ever more countries. The famous ‘Race Camp’ has already taken place at Silverstone for the German version of the Academy. Meanwhile, the European Race Camp runs from 29 July to 6 August and will feature competitors 42 of Europe’s most talented Gran Turismo 6 gamers from 12 countries. The GT Academy winners from Germany, Europe, the USA and the international group will immediately be thrust into the comprehensive Nissan Driver Development Programme with a view to racing in the international Dubai 24 Hours Race in January, 2014. Those with enough talent and determination may get the chance to compete as NISMO Athletes. GT Academy is a collaboration between PlayStation® and Nissan that uses the virtual world of the Gran Turismo®6 game to unearth real-world racing talent. Now in its sixth year, GT Academy includes separate competitions for Europe (France, Italy, UK, Spain, Portugal, Belgium, Netherlands, Luxembourg, Russia, Sweden, Poland and Czech Republic), Germany, USA, and a new International group (Australia, India, Middle East, Mexico and Thailand). The GT Academy qualification round will be part of a free Gran Turismo®6 update on PlayStation®3 (terms and conditions apply). The fastest gamers in each participating territory gain access to their region’s National Final event. A number of competitors can also gain access via a series of Live Gran Turismo events organised locally, and via a Facebook game entry mechanism that leads to a special GT6™ qualifying event. The National Finals add driving, fitness and a media element to the gaming. From National Finals, the action moves to Silverstone for the legendary Race Camp, where the competitors are put through their paces on track in Nissan sports cars under the watchful eyes of high profile judges and mentors. One winner from each competition will be invited to take part in the intensive Driver Development Programme. They could qualify for an international race license and race for Nissan at the Dubai 24 Hours in January 2015, before potentially joining Nissan’s elite NISMO Athletes. Previous winners of GT Academy are now regular racing drivers. In 2014, Jann Mardenborough (UK, winner in 2011) will be racing in GP3, a feeder series to Formula One, with the championship-winning Arden International team. Lucas Ordoñez (Spain, winner in 2008) will be racing in the Le Mans 24 Hours this year in the innovative Nisan ZEOD RC, alongside Wolfgang Reip (Belgium, winner in 2012). In 2013, Lucas won the Pro-Am Drivers Championship in the Blancpain Endurance Series. The 2013 Champions, Stanislav Aksenov (Russia), Miguel Faisca (Europe), Nick McMillen (USA) and Florian Strauss (Germany) are competing in the Blancpain Endurance Series with the Nissan GT Academy Team RJN..